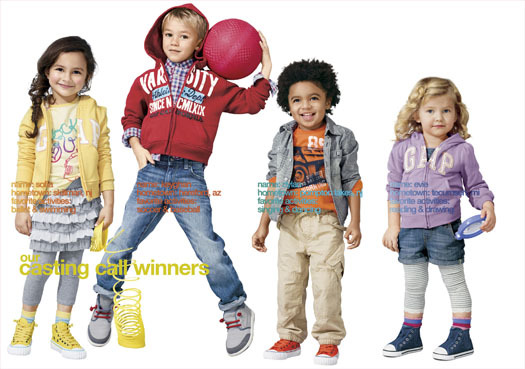 SAN FRANCISCO, Jan 22, 2011 / — Four cute and charismatic children were named winners of Gap fifth annual Casting Call contest. Chosen by America from more than one million entries, the new faces of babyGap are Evie Sowers from Tecumseh, MI; Dylan Bandale from Pompton Lakes, NJ; and for GapKids, Sofia Jaworovich from Skillman, NJ; and Keyghan Burns from Hereford, AZ. In addition to receiving a $1,000 Gap GiftCard, the winners’ bright smiles and twinkling eyes will be lighting up the newest babyGap and GapKids campaign in store windows coast-to-coast starting today. The windows also highlight each child’s hometown and favorite activities – from ballet and soccer to dancing and drawing. From September 27 to October 24, 2010, parents across the country uploaded photos of their babies and kids wearing their favorite denim looks at gap.com/castingcall. Judges then narrowed down the pool of more than one million entrants to 20 finalists – 10 babies and 10 kids. The finalists were announced in early December and it was up to America to cast their vote for their favorite finalists at gap.com/castingcall. The four winners of this year’s Casting Call – Evie, Dylan, Sofia and Keyghan – are featured in the windows of babyGap and GapKids stores nationwide and will receive a $1,000 Gap GiftCard. Evie, from Tecumseh, MI, has a great imagination and a fun personality to match. This blondie likes to read, draw and play with her dolls. Evie loves to rock out to Animal Collective’s My Girls. Dylan, from Pompton Lakes, NJ, has been called a “Will Smith look-alike” and is always flashing his “million-dollar smile.” He likes to sing and dance to his favorite Latin, Reggaeton and Hip-Hop tunes. His favorite meal is pizza with chocolate milk. Sofia, from Skillman, NJ, is a real “spitfire,” according to her parents, and is super outgoing. She loves meeting new people and making friends. This girly-girl likes to wear dresses and pretty shoes like her favorite singer, Taylor Swift, and her favorite hobbies are ballet and swimming. Keyghan, from Hereford, AZ, is fun loving and always makes others feel important. When he is not playing soccer or baseball, you can find Keyghan collecting Pokemon cards or hanging out with his friends and little brother.